The Rock Rings are an innovative, portable training device. Comes with two independent units - each with flexible single point suspension, which allows for the rotation of your joints, thus reducing the risk of injury. Rock Rings 3D - Pair is rated 4.0 out of 5 by 2. Rated 4 out of 5 by Daniel995 from Very durable and portable I dropped these into my concrete floor and they did not chip or crack at all. Very effective but slightly limited since they only have four different holds. 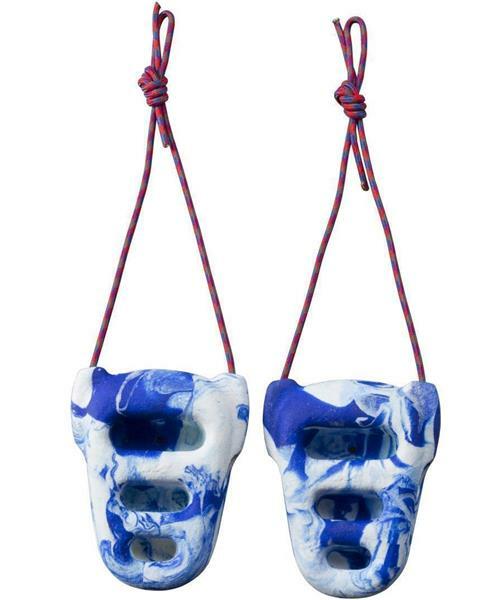 If you are just starting out and trying to build the first stages of grip strength these are perfect. If you are already an advanced climber these might not be challenging enough.